On this week’s episode of Ready, Set, Knit I had the chance to catch up with the fabulous Kristin Nicholas. Not only is she among the top echelon of the knitterati, she lives right here in our lovely valley. She has a brand spankin’ new book out called Color By Kristin. It’s amazing. If you’ve been scared of color work, scared of steeks (that would be me) this is the book for you. Kristin promises to ease my fears and if she can do that – the rest of you are golden because I am SURE I am the biggest scaredy cat among us! 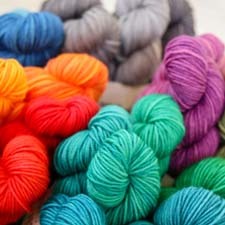 What I am most excited about is that we are now carrying Kristin’s JULIA YARN! Yes – the rumors are true! There is no substitute and it’s what she uses exclusively in her designs. We are stocking every color featured in her new book. 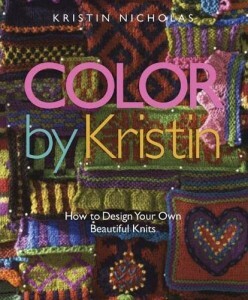 We are thrilled to be partnered with Kristin, her book and her yarn! Steve also talked about a bunch of yarns! Swirl DK from Lorna’s Laces – $6.99 – this is a great new closeout! Folks – listen to the podcast there are a lot of exciting announcements and I will be blogging about those as soon! You can listen to Ready, Set, Knit! via our website or you can download the podcast on iTunes. This entry was posted on Sunday, November 1st, 2009 at 11:47 am	and is filed under Authors & Designers, Products at WEBS, Ready, Set, Knit Podcast. You can follow any responses to this entry through the RSS 2.0 feed. You can leave a response, or trackback from your own site. Thank you so much for carrying Julia yarn!! I love it!